Hello Kitty Happy Holidays at Tanaka Farms! It’s beginning to look a lot like Christmas…especially at Tanaka Farms. Tanaka Farms brings us a lot of Hello Kitty happiness this holiday season as they officially launch their Sanrio Village! Today, November 24 they open up their supercute new hilltop “Sanrio Village” which is perfectly decorated for the holidays with our favorite Sanrio friends! There will be a very special holiday wagon tour where one can see the 30 acre farm, learn about the farm and taste delicious winter vegetables. There will be plenty of Sanrio photo opportunities throughout the farm and you can even get a picture with the main man himself, Santa Claus! Along with Sanrio photo opportunities, there is also a very special Tanaka Farm’s Holiday Market Stand where one can do arts and crafts and other fun holiday activities! The holiday fun starts today and runs till December 17. Pre-registration is required for attendance and admission is $18 per person (2 and under are free). Each admission ticket comes with a holiday wagon tour, a limited edition Sanrio button and a Sanrio holiday crown. Happy Hello Kitty Holidays starts today! Don’t you love this season? 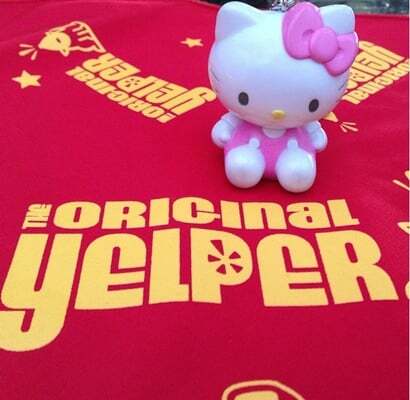 I do and I know Hello Kitty does too :). Hello Shake Shack El Segundo!